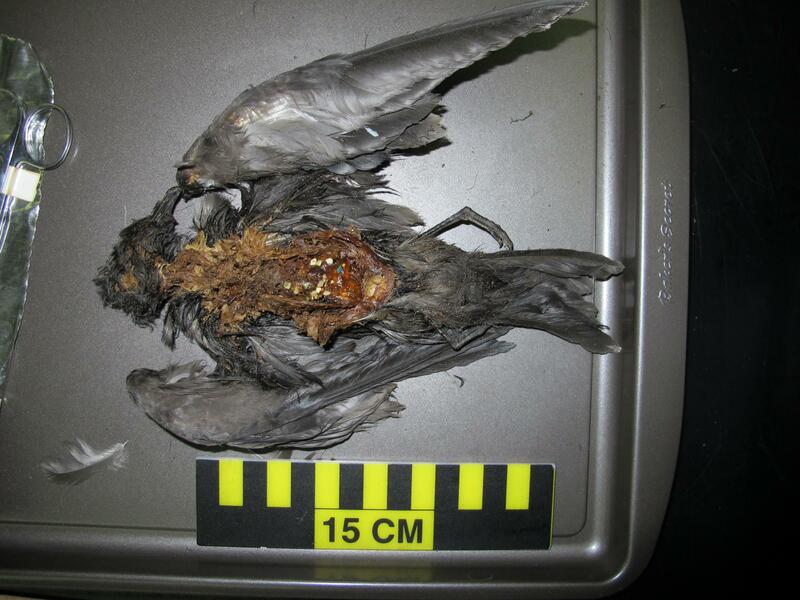 Some species of seabirds, including blue petrels, are particularly vulnerable to eating plastic debris at sea. Credit: J.J. Harrison. It turns out that marine plastic debris emits the scent of a sulfurous compound that some seabirds have relied upon for thousands of years to tell them where to find food, according to a study from the University of California, Davis. This olfactory cue essentially tricks the birds into confusing marine plastic with food. The study, published Nov. 9 in the journal Science Advances, helps explain why plastic ingestion is more prevalent in some seabird species than in others. Tubenosed seabirds, such as petrels and albatross, have a keen sense of smell, which they use to hunt. They are also among the birds most severely affected by plastic consumption. The study could also open the door to new strategies that address the ocean’s plastic problem, which plagues not only seabirds, but also fish, sea turtles and other marine life. To learn exactly what marine plastic debris smells like, the scientists put beads made of the three most common types of plastic debris — high-density polyethylene, low-density polyethylene, and poly-propylene — into the ocean at Monterey Bay and Bodega Bay, off the California coast. Taking care not to add to the marine plastic problem, the scientists placed the beads inside specially sewn mesh bags and tied them to an ocean buoy before collecting them about three weeks later. They brought the retrieved plastic to a somewhat unusual resource for marine ecologists — the UC Davis Department of Viticulture and Enology, where researchers are more often found analyzing wine flavor chemistry than smelly trash. Using food-and-wine chemist Susan Ebeler’s chemical analyzer, the team confirmed that, sure enough, the plastic reeked of the sulfur compound dimethyl sulfide, or DMS, a chemical cue released by algae, which coats floating plastic. Co-leading author Nevitt, with the UC Davis Department of Neurobiology, Physiology and Behavior, had previously established that DMS is a scent that triggers tubenosed seabirds to forage. DMS is released when algae is eaten by animals like krill, one of the birds’ favorite meals. So while the algae does not smell like food itself, it does smell like food being eaten, which is the birds’ version of a dinner bell. The study noted that seabirds that track the scent of DMS to find prey are nearly six times more likely to eat plastic than those that do not. Martha Wohlfeil, a UC Davis graduate student of ecology, was also a study co-author. The study was funded by a National Science Foundation Graduate Research Fellowship and the NSF Office of Polar Programs. Watch Savoca's TED-style, UC Grad Slam talk on this research. Press kit of photos and full study.